Posted by Hillary Zhang on 1/16/2019 5:22:13 PM. If you are an ebook enthusiastic, you probably are in desperate need for a powerful eBook management software which can catalog your books in a nice interface. Then you won't lose the track of your beloved books. Therefore, we have compiled a list of best 5 eBooks manager for you. Calibre is a powerful and easy to use e-book manager. calibre ebook management supports organizing existing e-books into virtual libraries, displaying, editing, creating and conversion of e-books, as well as syncing e-books with a variety of e-readers. It also supports many file formats and reading devices. Most e-book formats can be edited, for example, by changing the font, font size, margins, and metadata, and by adding an auto-generated table of contents. It'll allow you to do nearly everything and it takes things a step beyond normal e-book software. It's also completely free and open. Share and backup your library easily. Support many file formats and reading devices. Allow users to sort and group e-books by metadata fields. Support organizing, displaying, editing, creating and conversion of e-books, as well as syncing e-books with a variety of e-readers. Epubor.com is a well-known software producer. And it has done a wonderful job in its eBook DRM Removal and eBook Converter tool. Most of people may be familiar with its star software-Epubor Ultimate, the most powerful eBook DRM Removal and eBook Converter tool. Like always, Epubor has never let its customer down. So does this amazing ebook manager. 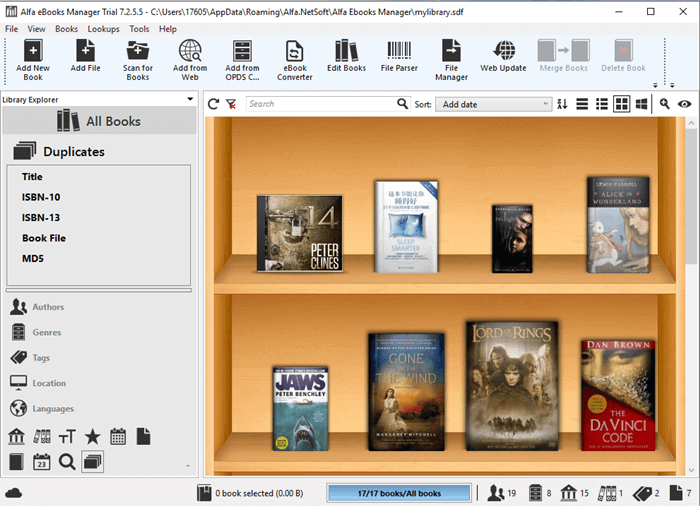 Epubor is an all-in-one eBook Manager for you to manage your eBooks from different sources. It supports you to classify, modify, convert and transfer your eBooks. 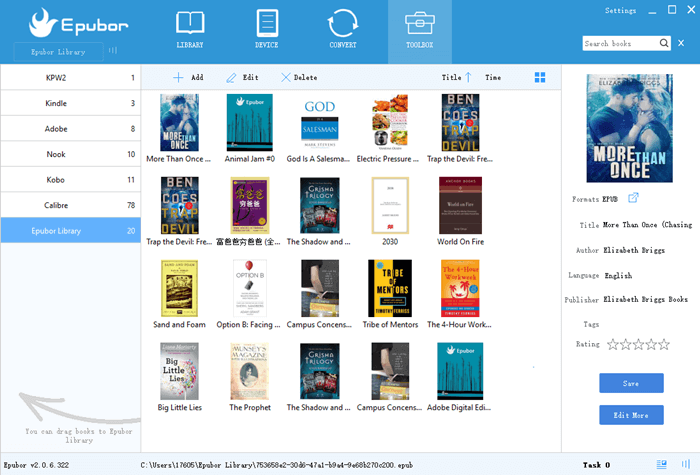 So with only one Epubor eBook Manager, you will own Epubor Ultimate, Kindle Transfer, eBook Reader, eBook Manager and eBook Editor tools instead. Isn't that super dope? Satisfy every e-book need and get support. Save time on managing your e-book collection. Support decrypting and converting encrypted eBooks. Allow users to transfer encrypted eBooks between devices. Web Server allows users to access your Epubor Library books on any device. Catalog eBooks from your devices, Kindle for Mac/PC, Adobe Digital Editions, calibre and iTunes by automatically scanning. Epubor eBook Manager is the most powerful and functional ebook management software. With Epubor, you can also remove DRM from your purchased ebooks, convert book formats and transfer encrypted book between e-ink devices without installing any plugin. Alfa eBooks Manager is the most powerful and easy-to-use book organizer for Windows OS only that allows to organize your electronic and paper books in a single e-Library. It makes ebook collection management fast and easy, saves your time and keeps your electronic library safe. Besides, our ebook catalog software enables you to retrieve ebook information from public web-sources and create beautiful library visualization. With Alfa eBooks Manager you can handle your book data and book files at the same time. Move files between your computer and your eBook reader. Allow to easily manage and play mp3 and m4b audio books. Built-in ebook reader supports most popular formats of books. View and edit ebook metadata for most popular ebook formats including PDF, EPUB, MOBI, AZW, FB2. Convert books from one format to another. Most popular conversion directions are supported. Delicious Library is a paid digital asset management app for Mac OS X, developed by Delicious Monster to allow the user to keep track and manage their physical collections of books, CDs, and video games. Delicious Library 3 is available from the Mac App Store and the developers website for Macintosh systems running OS 10.8 or higher. More importantly, Delicious Library wins Apple Design Award in 2015 for its best user experience. Support rating stuff you don't even own. Import all your stuff onto your digital shelves using your Mac's iSight webcam. Catalog your books, movies, music, software, tools, video games in a nice interface. Integration with Mac OS X's Address Book application to allow lending management. 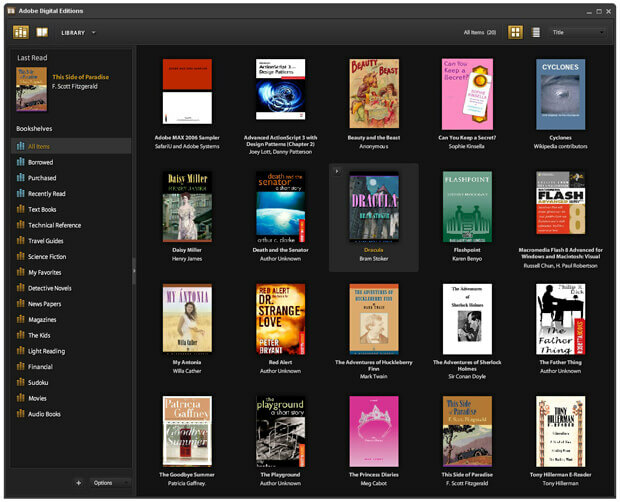 Adobe Digital Editions software offers an engaging way to view and manage eBooks and other digital publications. Most major publishers use Adobe Digital Editions(ADE) to proof-read their books. Use it to download and purchase digital content, which can be read both online and offline. Transfer copy-protected eBooks from your personal computer to other computers or devices. Organize your eBooks into a custom library and annotate pages. Adobe Digital Editions also supports industry-standard eBook formats, including PDF and EPUB. Borrow eBooks from many public libraries for use with Digital Editions. Bookmark, highlight or note important and favorite portions of text from your eBook. Search for keywords across all chapters in your eBook through an intuitive full-text search functionality. Downloaded books on one device will appear automatically across all the devices you have ADE on. All the above eBook manager has their distinguished advantages. Delicious Library and Alfa eBook Manager are paid software. 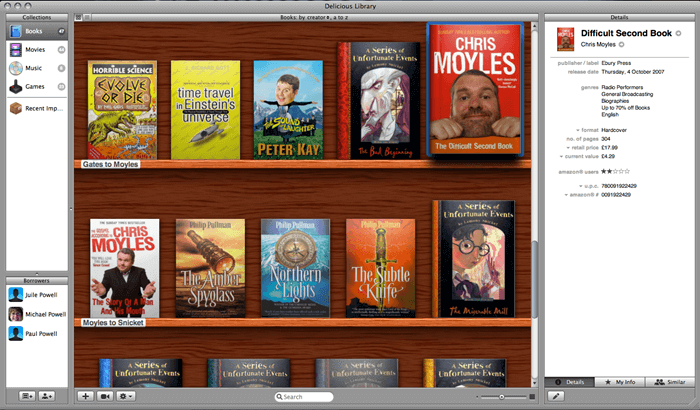 And Delicious Library is only available for Mac OS and Alfa eBook Manager can only be used on Windows OS. 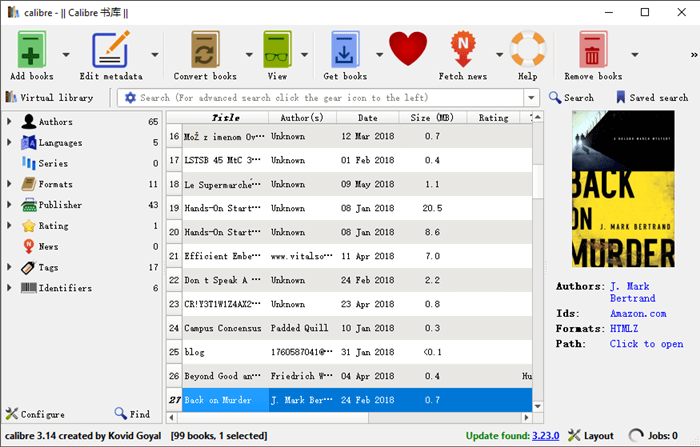 The freeware Calibre, ADE and Epubor can be used both on Window and Mac computer to help you organize your ebooks perfectly. While the paid version Epubor can help you decrypt DRMed ebook and convert formats for you without installing any plugin. Besides this, Epubor can also help you transfer encrypted books to kobo or Kindle e-ink reader fastly and easily.